Late Show host Stephen Colbert was surprised on Tuesday when his audience cheered lustily as he informed them that President Donald Trump had fired FBI director James Comey. 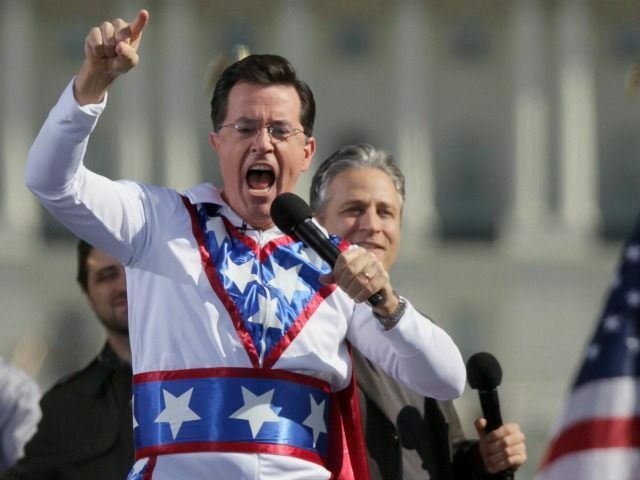 Evidently the left-leaning Colbert fans had not yet heard the news that Democrats, having called for Comey to be fired for months, were now using his firing to accuse Trump of a cover-up and abuse of power. “Wow, huge Donald Trump fans here tonight,” Colbert said, pointing at the audience. He then explained why they should not cheer. “No rationale has been given yet as to why [sic], but it came on the recommendation of Attorney General Jeff Sessions,” he said, drawing boos from the audience. “I think I might know why. I think he was fired because Comey couldn’t guess the name, ‘Rumpelstiltskin,'” Colbert quipped, drawing mild laughter. Stephen Colbert’s “Late Show” audience initially cheered loudly on Tuesday at the announcement that President Trump fired FBI Director James Comey minutes earlier, visibly vexing the comedian. Presumably, the left-leaning audience thought this was positive news ever since Comey angered Democrats with his late-October letter to Congress announcing the discovery of emails related to Hillary Clinton’s email scandal. Clinton herself has cast blame on Comey for costing her the election. Colbert has used his opposition to Trump to drive rating for his show, in what has become an arms race among late-night hosts to offer the most vehement “resistance” to the president.